Thank you for your interest in this free e-book entitled, "Journey of the Crystal Skulls, the e-book edition". 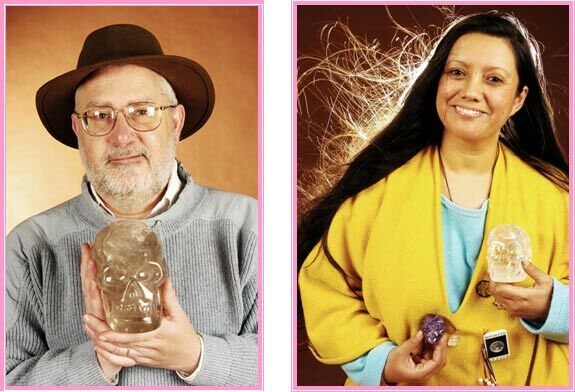 This e-book offers for our friends around the world a brief taste about the crystal skulls and shares a little bit about the joint and individual work we do with our crystal friends. By the way this is a slightly newly revised revision of our free e-book, so if you have downloaded an earlier version (from 2003 or through the early part of 2009) or received it from a friend before, you may want to get this updated copy. To receive your copy of this free e-book, please just fill out the simple form near the bottom of this page including your name, organization (if any), country and email plus there is an optional field if you would like to leave us a note. Additionally there are three questions related to future activities connected to the crystal skulls you may indicate if you have a personal interest in, so we may contact you about this at a future time. After you complete this form, you will be presented with a thank you page which will give explain how you can download your copy our free e-book (the 2008 edition). Special Note: As a special token of our gratitude for your interest and support for our work with the crystal skulls, for this 2008 edition we have included a link to obtaining another very important FREE e-book that we were gifted by a friend who is a multi-millionaire. This published book has been out of print for over 70 years and helped our friend achieve his success. This book also is strongly linked to the ideas expressed in the popular movie called "The Secret".